A group, Igboezue, has slammed the South East delegates to the ongoing National Conference for their “abysmal performance” since the conference began. In a statement on Friday by its leader, Chekwas Okorie, the group said it was worried that the core issues which persuaded Ndigbo to embrace the conference with great enthusiasm and hope had no potential of being addressed. Among the notable Igbo leaders attending the conference are two former Senate Presidents, Adolphus Wabara and Ken Nnamani; President of Ohaneze Ndigbo, Gary Enwo-Igariwey and his predecessor, Dozie Ikedife; a former foreign affairs minister and retired army general, Ike Nwachukwu; former governors – Achike Udenwa, Jim Nwobodo, Chukwuemeka Ezeife and Sam Egwu. Others are former ministers – Ihechukwu Maduibuike and Alphonsus Nwosu, former senator, Nnamdi Eriobuna, National Chairman of Labour Party, LP, Dan Nwanyanwu, and Anya O. Anya. Prominent on the agenda of the Igbo race to the conference is the creation of another state in the South East zone to bring the number to six as it is in the other zones except the North West, which has seven. “We have watched with deep concern the lackluster performance of the delegates from the South-East geopolitical zone at the on-going National Conference at Abuja,” Igboezue said. “We chose to speak out at this time when the 20 committees set up by the conference have concluded their deliberations and submitted their recommendations for consideration by the plenary session of the Conference. The group said it had expected that the conference would come up with a new draft Constitution that would usher in a new era of a more equitable, and justiceable Nigerian political structure that would be fair to all the ethnic nationalities that make up Nigeria. It said it had expected a true federal structure that would be anchored on Nigeria’s six geo-political zones as federating units on the basis of equality, devolution of power, fiscal federalism, equitable revenue allocation formula in the form of resource control, citizenship rights etc. The group stated further, “We are exceedingly disappointed at the abysmal performance of the Igbo delegates who in spite of well-founded reservations on their ability to deliver on their mandate considering the manner of their appointment, were given benefit of the doubt, supported and encouraged,” the group said. “It has become clear even to the unwary that all the Igbo delegates to the Conference were mere sitting ducks who were struck by certain strange and mysterious “deaf and dumb” ailment. No profound statement reflecting the aspiration and expectation of Ndigbo in Nigeria could be ascribed to any Igbo delegate at the National Conference. The group also cautioned Nigerians, especially those at the National Conference and the members of the National Assembly currently in the process of amending the Constitution that Ndigbo should not be treated with levity on a matter that is dear to our people in the Nigerian Project. “We wish to sound it loud and clear that the irreducible minimum condition to pacify Ndigbo is the incorporation of Nigeria’s six geo-political zones into the Nigerian Constitution as federating units on the basis of the equality of the zones,” Igboezue said. 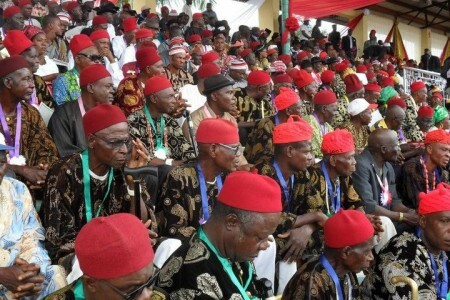 The group said in the event of any conspiracy to deny Ndigbo this minimum condition, it would not hesitate to mobilize similarly inclined Igbo groups and associations in Nigeria and in the Diaspora, to convene as a matter of urgency, an All Igbo Consultative Assembly to review the fate of the zone in the country and take their destiny in their hands.